Understand the Health of a Water Network Before, During, and After a Storm Event. Tracking storm water events can be a challenge because of the inherent unpredictability of storms. 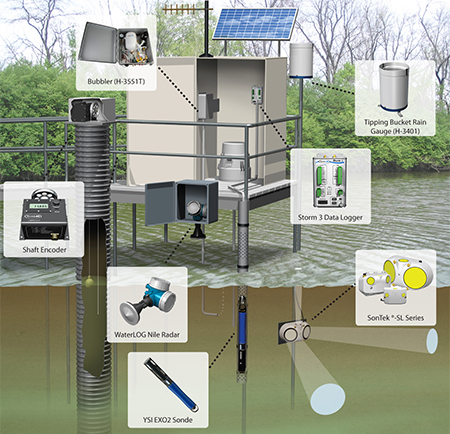 Our analytical instrumentation supports the growing trend towards automating stormwater monitoring. 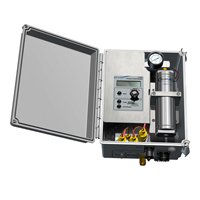 Measuring flow, rain, level, or water quality can be accomplished in real time through an automated solution from YSI. This ensures events are captured as they happen, whether that is in the middle of the day or the middle of the night. Indicate water changes from a central location. Our water quality instrumentation can detect sediment and contaminates washed into streams from falling rainwater. As the water level rises WaterLOG bubblers can detect the change in level, while a SonTek flow meter detects the changes in water velocity. Let our Integrated Systems and Services group customize a complete turnkey monitoring solution for automated stormwater monitoring. Designed specifically for side mounting on bridges, canal walls, or riverbanks, the SL's low profile housing makes installation easy. With three models to choose from, the SonTek SL can be used in channels small enough to jump across to rivers as wide as the Amazon. Ideal for near shore deployments in less than 40 meters of water. Designed specifically for mounting on the bottom of a river, channel, or harbor, the SonTek Argonaut®-XR features a special mode that automatically adjusts one of its measurement cells for changing water level. Its small size, rugged build, and flexible system architecture make the XR attractive for both real-time operation and autonomous deployments. Capable of working both in man-made as well as natural channels, the SonTek-IQ can collect flow (area-velocity) and volume data in as little as 8 cm (3 in) of water. It handles full or partially-full pipe conditions, slow, and even reversing flow with ease. Its five-beam pulsed Doppler design adapts to changing conditions and captures high-resolution data throughout the flow field. With the SonTek-IQ, expect to get quality data for quality decision making. 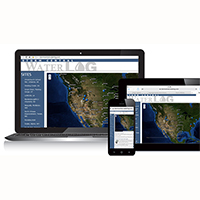 The WaterLOG® Storm 3 is a mid-range data logger with an ideal cost-to-performance ratio. Communicate through GOES satellite and cellular modems using a balanced set of inputs for analog, digital I/O and SDI-12 smart sensors. Easily configure and collect data using the browser-based graphical user interface with all standard web browsers on PCs, tablets and smart phones. Capable of maintaining accuracy at increased rates of rainfall ranging from 0-25 inches (635 millimeters) per hour, the WaterLOG Tipping Bucket Rain Gauge has two removable stainless steel funnel screens and a rust-proof enclosure. It also has a magnetic reed bucket tip sensor and an internal leveling mechanism with a ‘bulls-eye’ level to ensure high accuracy data. Monitor in real-time with alerts for storms and floods. This system is modeled off of hundreds of monitoring sites installed and maintained by YSI globally. The most important aspects when exploring any stormwater monitoring project is proper site and sensor selection. Select instrumentation from the categories below to help us design a stormwater monitoring system that meets the essential data delivery needs of your specific project. A smart, field-ready water monitoring platform that is suitable for long-term, continuous monitoring. With wet-mateable connectors, smart, sensors, an anti-fouling wiper, and numerous onboard monitoring systems ensure successful deployments. Designed for mounting on bridges and platforms directly over the water, the WaterLOG Nile Radar offers a non-contact water monitoring solution in a light weight, compact instrument. Its reliable interface and simple SI-12 and RS-232 communication ensure seamless integration with current water monitoring stations. 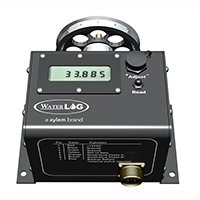 Accurately measure water levels through continuous, non-contact transmission. 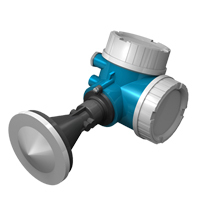 The H-3553T is a combined constant flow Bubbler with built-in NIST traceable pressure sensor. Directly measure dry gas with high accuracy with this complete bubbler system. This model provides the highest purge pressure in the industry-up to 90 PSI. Accurately measure water level in a stilling well. 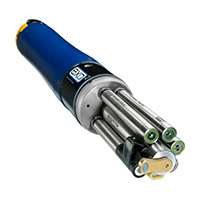 The H-3342 Shaft Encoder measures water level by monitoring the position of a float and pulley, with a magnetic sensor to minimize static sensitivity allowing for high-accuracy data. This series is user friendly with a built in LCD display and compatible with most data loggers. Data hosting through Storm Central allows data download from any computer or mobile device with an internet connection. Custom alarm notifications via SMS text and / or email let you know when a sample has been taken and of other alarm criteria-such as a parameter exceeding a maximum limit. Pair with the Storm 3 data logger with optional internal, built-in cell modem for quality data collection.